Cape Cod is synonymous with summer and has long been a go-to vacation destination. East coasters who are in proximity of Massachusetts’ “crooked arm” 70 mile-long peninsula are frequent visitors, and it’s here that mid-westerners often get their first sight of the Atlantic Ocean. Where to stay? There are lots of choices, including a preponderance of mid-century motels. Not without their charm, any one could be the destination of a Norman Rockwell family—via a wood-panelled station wagon. There are some budget chains, up-a-notch hotels and inns converted from 19th-century Victorian homes. However, if you are looking for 5-star luxury, the Wequassett Resort & Golf Club delivers. 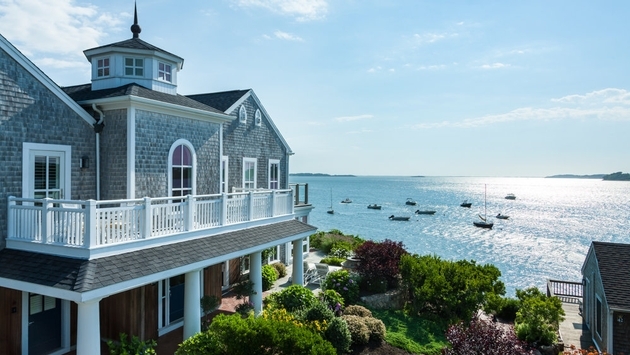 Nestled (as they say) in Cape Cod’s elbow, the Wequassett is a grand hideaway. Its meandering 27 acres has a village-like feel. Overlooking Pleasant Bay, it offers stunning views of the mighty Atlantic. Brick paths wind through manicured lawns, wooded areas and gorgeous gardens with natural plants and hydrangeas galore. The resort centers around a graciously restored 18th-century house. Twenty one buildings house 120 rooms and suites. Accommodations range from the suites of their lux Signature Collection, clapboard cottages—spacious yet cozy with water views (I bunked in at #41 and adored it)—and garden view guest rooms in two-storied buildings. A couple of multi-bedroom cottages would be perfect for families seeking more space. All the rooms are beautifully appointed with rich fabrics and nautical touches—just Cape Cod-ey enough. Moulton Brown amenities are a nice touch. Settling on a comfy oceanfront chaise lounge makes for an ahh-level summer afternoon. You can indulge just steps from the water or go toes-up by a pool that can be best described as swanky. Take it up a notch and reserve one of the cabanas queued up on a terrace overlooking it all. A pool bar sits under the shade of an elegant pergola, and staff will happily serve you chaise-side. Well, if you’re looking for exercise, there’s an adults-only pool laps pool and four Har Tru tennis courts. Contrary to its name, the Wequassett doesn’t have a golf course on site. However, guests have access to the nearby members-only prestigious Cape Cod National Golf Club, par 72, 18-hole course. Once checked-in, you may never want to leave, but if you do, there’s exclusive access to the National Seashore’s exquisite Outer Beach via a boat shuttle. Chatham’s main street is close enough for an impromptu stroll and shopping. (Think quintessential New England town with upscale boutiques.) And the resort’s concierge can schedule an array of activities from antiquing to whale watching. Oh, and they’ll order you a picnic lunch. Under the direction of Executive Chef James Hackney (formerly with Boston’s legendary L’Espalier), Wequassett’s Twenty-Eight Atlantic delivers one of the Cape’s finest dining experiences, and it comes with a stunning 180-degree water view. The halibut is divine. Lighter fare is served in the cozy tavern Thoreau’s. (They served a great burger, though the chowder was a bit disappointing.) For al fresco noshing, there’s the Outer Bar & Grille. Its menu is also served at the circular poolside terrace. I spent as much time as I could on my private deck at Cottage #41 overlooking the water. An umbrella table prompted me to have breakfast delivered, so after a walk on the beach, I did. Then I exhaled and enjoyed. If I’d stayed longer, I might have had dinner there as well. The cottage’s primo location is steps from the fitness center, if you are so inclined, and conveniently near the pool and that pool bar aptly named LiBAYtion. Who would love the Wequassett? Anyone seeking a luxurious yet easy-going getaway, romantic or otherwise. And families. A Children’s Center that’s suitable for even toddlers, features “sea-worthy” playgrounds with fountains, sprays and a summer-long children’s program. Older kids can kayak, paddleboard or take a tennis lesson. And an old-school ice cream truck makes its rounds throughout the day. 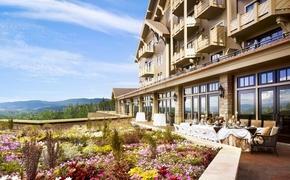 The resort is open seasonally, April through November. Although we do equate Cape Cod with a summer vacation, it's quiet and gorgeous in the fall. September beach days are poignantly sweet, the golf is fabulous and many of the rooms have fireplaces to chase away the evening chill.